All the fringe benefits without making the cut. A well-known haircut is hair bangs. As this is a big commitment to your hairstyle the Clip-In Fringe offers the perfect solution to a permanent chop. The clip-in extension integrates perfectly with the natural hair and can be curled or straightened time after time. 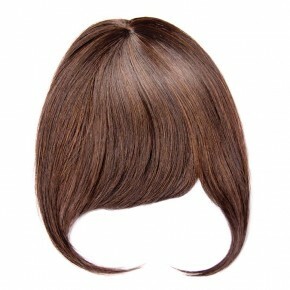 This fringe made of 100% Human Hair is manufactured using the best quality hair, called Session Hair. Session Hair is a blend of fine and thicker hair that blends perfectly into the natural hair. Use Balmain Professional Aftercare to validate the unique 6-months guarantee on the hair. If you consider to color the Clip-in Fringe, we highly recommend to use level colors (L10, L6, L8, 1) instead of fashion capital colors. These level colors are made of a single tone which makes it easier to reach the desired result. Make a parting at the center of your head. Position the center clip near the crown area of your head. Secure the fringe near the hair line with the side clips. Trim the bangs if needed and style as desired. The Clip-In Fringe is ideal for those who want experiment with bangs without making permanent changes to their hairstyle. Style the Clip-In Fringe with the Professional Titanium Straightener or Ceramic Curling Iron (max. 160°C / 320°F) for a perfect blend with the natural hair.